The last in this series. Colouring with Distress Inks Part 3 is all about the clothes. So in this video we are going to cover a cool way to water colour the clothes. Then once you have finished you will have a delightful topper to add to your cards. It is a process that I hope you will really enjoy and the results can be stunning. As with all things the more you practise the more your confidence grows and the better you will become. 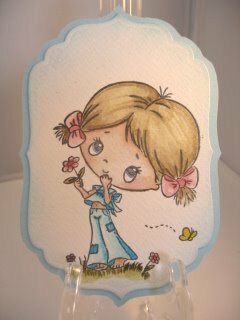 The idea is to enjoy this, and all aspects of cardmaking, and not become stressed by it all. This little girl is from Lili of the Valley and is just one of many beautiful images.... and there are new ones being added all the time. I promise you ... you will be spoilt for choice. It should be a hobby that you enjoy and will want to return to time and time again. 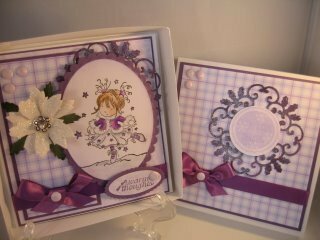 The video tutorials are all created to help you make cards that you can be proud to give. The Distress Inks are wonderful for the skin and hair, but the clothes can be done using the Big'n Juicy Ink Pads as the colours are much more vibrant. Or you can try any Water based ink that you have ...maybe the brand names are different in your country. The cards you make should please you just as much as they do the recipient, and if you make a mistake, don't worry about it, it really doesn't matter. It is only card and paper and you can chalk it up to experience and relax and start again.